Sometimes living things don’t share a perfect symbiotic relationship. 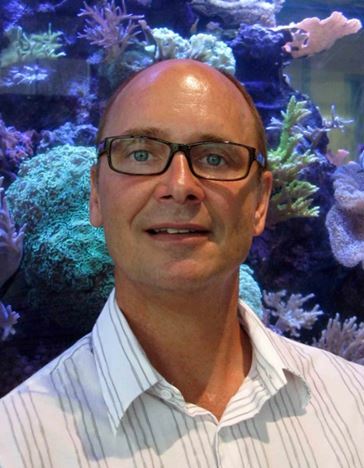 Joseph Pawlik, a professor at The University of North Carolina Wilmington, discusses sponges and coral reefs. Joseph Pawlik received his BS in 1982 from the University of Minnesota, Twin Cities, and his PhD in 1988 from Scripps Institution of Oceanography, UCSD. After postdoctoral fellowships at Friday Harbor Labs (U. Washington) and Woods Hole Oceanographic Institution, he joined the faculty at UNC Wilmington in 1991, where he teaches Invertebrate Zoology and directs a research program involving undergraduate, MS and PhD students. Dr. Pawlik has over 130 scientific publications, mostly in the areas of marine chemical ecology and the biology of sponges on Caribbean coral reefs. Subscribe to the Pawlik Lab‘s YouTube channel here. The health of coral reefs around the world has declined over the past 3 decades, but corals are particularly threatened on Caribbean reefs, where the combined effects of warming seawater temperatures, storms, and diseases have decimated these slow-growing creatures. The critical importance of coral reefs for both shoreline protection and fishery habitat has led the United States government to list some reef-building corals under the Endangered Species Act. 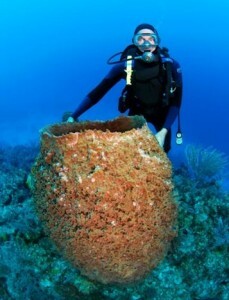 At the same time that corals have been in decline on Caribbean reefs, populations of sponges have been doing very well. For reef-building corals, sponges do not make good neighbors. Aggressive competitors for space, sponges use toxins, mucus, shading, and smothering to kill adjacent coral colonies and then grow on their skeletons. We surveyed reefs from 12 countries across the Caribbean, comparing 25 sites where fish abundance is very low because of decades of intensive fish-trapping with 44 sites where fishes are plentiful because they are protected from fishing. Over 25% of coral colonies at overfished sites were in contact with sponges, more than double the incidence for less-fished reefs. On less-fished reefs, fast-growing sponge species were eaten by angelfishes and parrotfishes, leaving only slow-growing sponge species that are protected from these predators by distasteful chemical defenses. Coral conservation requires a healthy population of reef fishes. Caribbean nations can now base their fishing policy decisions on the clear connection between overfishing and sponge-smothered corals. These nations include the United States, which has over a million acres of coral reefs in the Florida Keys, Puerto Rico, the Virgin Islands and the Gulf of Mexico.